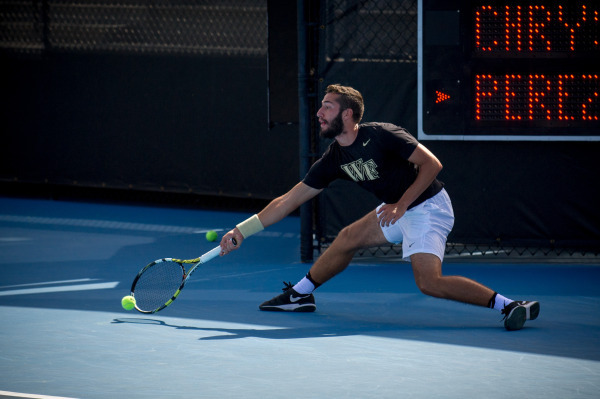 The sun was shining as the Wake Forest men’s tennis team swept unranked Virginia Tech 7-0 at the Wake Forest Tennis Complex on Tuesday, March 21, 2017. Last week, Wake Forest ranked No.1 in the NCAA, and the team proved themselves with hustle and agility against the Hokies. Top-ranked doubles team Skander Mansouri and Christian Seraphim had a 6-4 victory over the Hokies doubles team of Jai Corbett and Korsgaard. Despite their slow start, the duo made a fierce comeback after a series of overhead shots and well-placed drop shots. Doubles team Petro Chrysochos and Dennis Upensky lost 7-5 on court three. Attention turned to Borna Gojo and Alan Gadjiev playing at the No. 2 doubles spot. Disputed line calls didn’t disrupt the duo as they continued to fight hard for a 7-5 victory over their opponents. The Deacs came out strong during singles play. On court number one, singles player Petra Chrysochos battled for his win against No. 82 Corbett. After losing the first set 5-7, he rallied for a 6-5 win in the second set. The tie-breaking set resulted in another Wake Forest win at 10-7. Chrysochos is a sophomore and remains the number two player in the country. No. 14 Skander Mansouri eventually defeated Virginia Tech’s Alexandre Ribeiro after two tie-breaking sets. In the first set, Mansouri fell behind quickly, but it wasn’t long before he began to gain on Ribeiro. The set spilled into a tiebreaker, and Mansouri claimed the first set 7-5. Mansouri snagged the second set after another tiebreaker, 7-3. The Deacs were victorious on all courts with Christian Serpahim defeating Henrik Korsgaard 6-3, 6-2. Dennis Upensky beat Freddy Mesmer 6-3, 6-4. Alan Gadjiev battled Jason Kros 6-3 in the first set, and won the second set after a 7-6 tie break. The Wake Forest Men’s tennis team will travel to Clemson for their match on Friday evening at 5 p.m. On Sunday, March 26, the Deacs will play No. 17 Georgia Tech in Atlanta at 12 p.m.
Support your Deacs at home when they return to the Wake Forest Tennis Complex to play No. 2 Virginia on Friday, March 31 at 4 p.m.
Caitlin is a junior studying communication with minors in film studies and journalism. She enjoys covering events, trends and travel for the Life section of the Old Gold & Black. Caitlin hopes to pursue a career in journalism after graduation. When she’s not in the office, you can find her working as the Four Seasons Magazine intern, suffering through an intense spin class or eating copious amounts of chocolate covered coffee beans.